This website is very nice (http://www.visualizingeconomics.com/) – Visualising Economics. 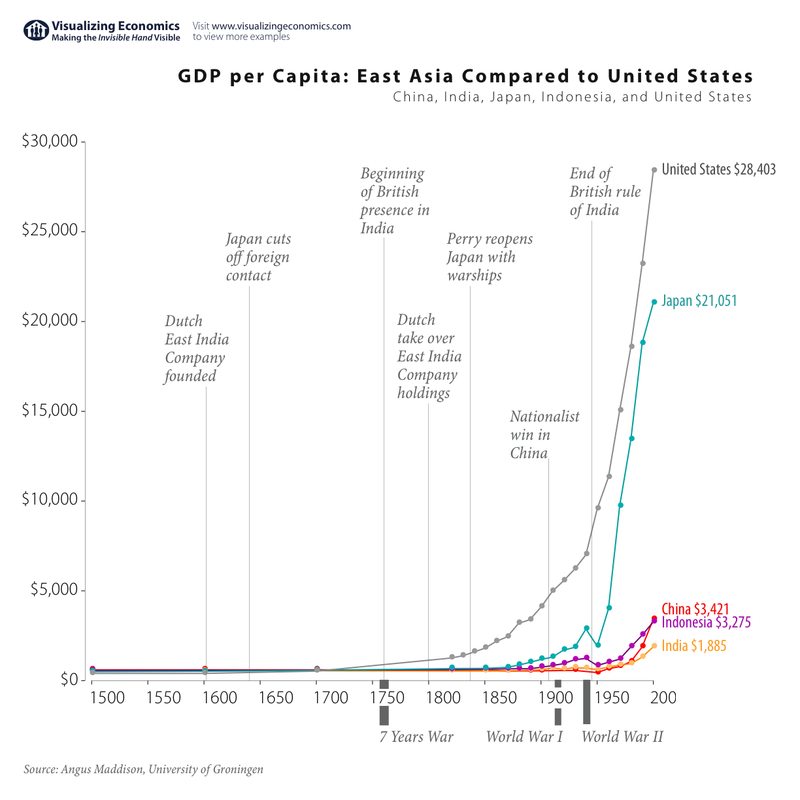 From here I've copied the following chart which is fascinating since it depicts the UNBELIEVABLY HUGE increase in per capita income achieved by the West since the industrial revolution. That is what I meant by the consequences of changes to the rule of the game between 1400-1750, being essentially the concept of freedom and critical thinking applied to daily life; the move to individual sovereignty. Many 'educated' Indians still imagine that the West is just a little better than India. It is not! Yes, India was VERY RICH at one time – relative to others – but the West is FAR richer now. It suddenly shot up, like a rocket! I'm very sceptical about the ability of India to eliminate poverty and lift its millions of people to wealth without the leadership of FTI. There are so few people in India who understand what it will take for India to recover its past economic leadership. I invite all such people to join FTI. I also request others to support FTI in every way (including financially) if they are serious about creating a truly wealthy India by 2050. The task is VERY HARD, and only a very few people know what needs to be done. Please support them! I promise that India will then become very, very rich. Guaranteed.